Colorstrology creates a personal color for every day of the year that embodies certain characteristics and qualities that help you to understand yourself and navigate the world that surrounds you. According to Michele Bernhardt, "Your birthday color may or may not be your favorite color, but it is a color designed to nurture the real you to recognize, celebrate and honor your own TRUE COLORS. While your color preferences may change as you evolve, your birthday color remains constant." 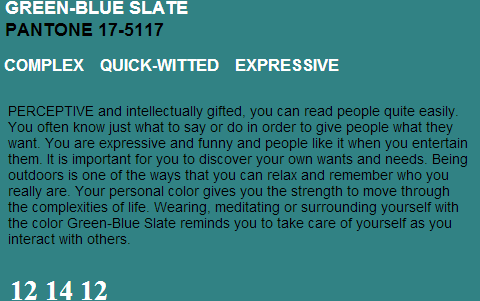 To learn more about Colorstrology you can read "What Your Birthday Color Says About You" by Michele Bernhardt or visit www.colorstrology.com. Between moving, the holidays and getting a promotion at work things have been a bit hectic so please forgive my absence and enjoy some links to the most interesting news I've seen all recently. Triple spiral, celtic triskele is sometimes called the spiral of life. It was found in Newgrange site in Bronze age (or older) Ireland. 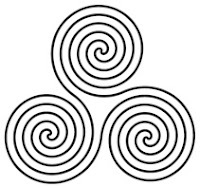 It remained in Celtic art for 3,000 years. birth, death and rebirth. Mind, body & spirit. Slate curated a list of The Overlooked Books of 2012, which mentions both, I Am an Executioner by Rajesh Parameswaran and Monstress by Lysley Tenorio that are worth a look. 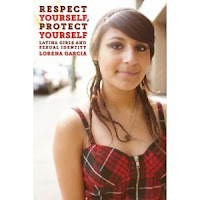 Readers interested in Machismo and Mexico might take a look at ALMOST NEVER. By Daniel Sada featured in the NY Times 100 Notable Books of 2012 list. You can find more good reads with “Best of” lists created by NPR,Publishers Weekly, Esquire, HuffPo and The Guardian. Deadspin made me laugh with their The Hater’s Guide To The Williams-Sonoma Catalog. Women, social roles, and the intellectual situation. Whoosh! Publishing's lack of Latino Literature put on blast here. But perhaps it's just a matter of awareness and accessibility Blogger Mary Ann Reilly has curated an awe inspiring list of Latino/a Books for Elementary Children, see part 1, part 2, part 3. Nicely done, folks! I am super excited about the Future of Consumer Intelligence conference I am working, not only do I get to head back to San Francisco but I get to hangout with some of the brightest minds who are shaping the high-technology revolution as it intersects with marketing and business opportunities for the future. Speaking of mind melds, Scientists Discover Children’s Cells Living in Mothers’ Brain. Mother Jones shines a light on sexism within the video game industry. This etymology of the C-word makes me reconsider my hatred of it. The perfect books to gift for the Holidays: Gran Cocina Latina: The Food of Latin America by Maricel E. Presilla and This Is How You Lose Her by Junot Díaz. I love that Maria Popova, the mastermind of the Brain Pickings blog, was featured in the Times. The OCM Bocas Prize for Caribbean Literature for 2013 is now open for submissions. The Bill and Melinda Gates Foundation Global Libraries Initiative is asking some well-crafted questions of this kind in a survey I’d urge you to fill out. A new initiative is focusing on libraries around the world as centers of social and economic change. 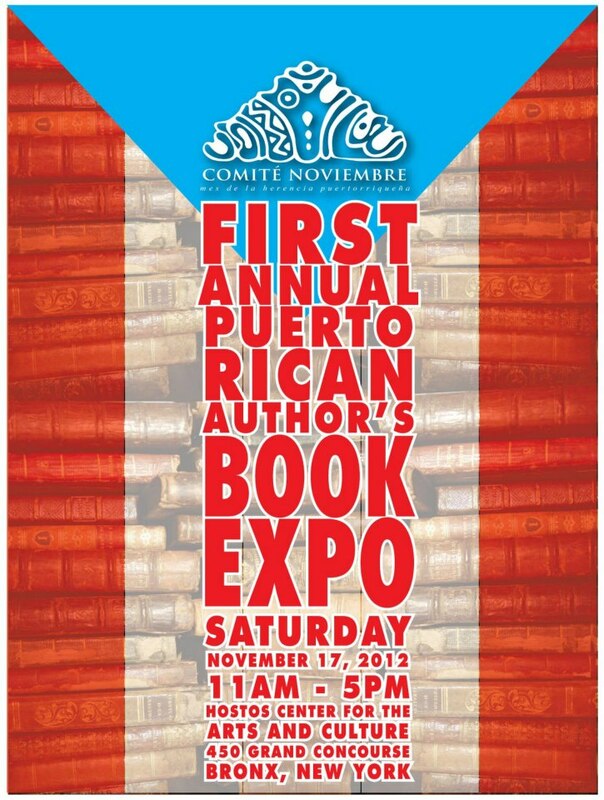 Don't miss this book by Domingo Martinez. 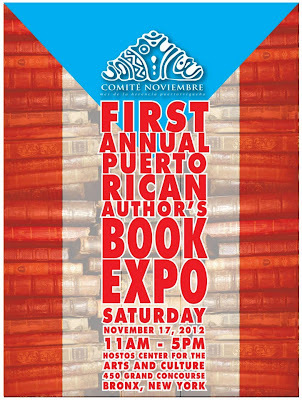 He is a 2013 Pushcart Prize nominee and a Finalist for 2012 National Book Award. 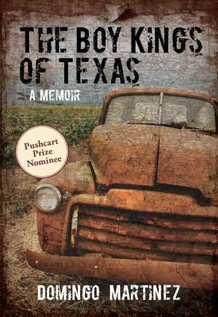 A lyrical and authentic book that recounts the story of a border-town family in Brownsville, Texas in the 1980's, as each member of the family desperately tries to assimilate and escape life on the border to become "real" Americans, even at the expense of their shared family history. This is really un-mined territory in the memoir genre that gives in-depth insight into a previously unexplored corner of America. I don't know about the Post-Racial part but this one is for all the kids (like me) who've ever been called "coconut," "oreo," "apple" or "banana." 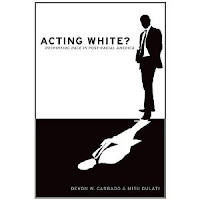 In Acting White, Devon Carbado and Mitu Gulati argue that racial judgments are often based not just on skin color, but on how a person conforms to behavior stereotypically associated with a certain race. Specifically, people judge racial minorities on how they "perform" their race. That includes the clothes they wear, how they style their hair, the institutions with which they affiliate, their racial politics, the people they befriend, date or marry, where they live, how they speak, and their outward mannerisms and demeanor. Employing these cues, decision-makers decide not simply whether a person is black but the degree to which she or he is so. Relying on numerous examples from the workplace, higher education, and police interactions, the authors demonstrate that, for African Americans, the costs of "acting black" are high. This creates pressures for blacks to "act white." But, as the authors point out, "acting white" has costs as well. Written in an easy style that is non-doctrinaire and provocative, the book makes complex concepts both accessible and interesting. Whether you agree and disagree with Acting White, the book will challenge your assumptions and make you think about racial prejudice from a fresh vantage point. Devon Carbado is Associate Dean at the UCLA School of Law and Professor of Law and African American Studies. Mitiu Gulati is Professor of Law at Duke University. 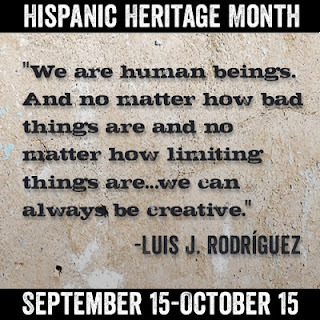 Hispanic Heritage Month ends today but I encourage you to celebrate the contributions, leadership, and culture of Latinos everywhere throughout the year. Please enter below to win 1 of 2 prize packages, which includes a For Greater Glory DVD, starring Peter O'Toole, Andy Garcia and Eva Longoria, a Safe House DVD, starring Denzel Washington and Ryan Reynolds, and an ARC of Count on Me: Tales of Sisterhoods and Fierce Friendships by Las Comadres Para Las Americas and Adriana V Lopez. Rodríguez is a poet, journalist, memoirist, children’s book writer, short story writer, and novelist whose documentation of urban and Mexican immigrant life has made him one of the most prominent modern Chicano literary voices. 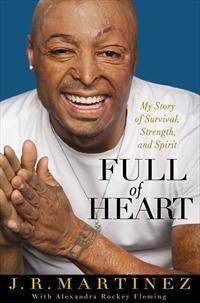 He is perhaps best known for his memoir Always Running (1993), a powerful account of his time spent in Los Angeles–area gangs in the 1960s and ’70s. 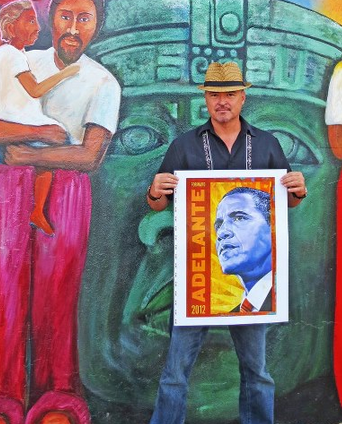 One of Rodríguez’s primary concerns as a writer continues to be the experience of poor immigrants in US cities, a theme reflected in his novels and children’s books as well as first-person accounts. - National Reading Group Month: Great Group Reads List announced here. What just might save her is her search for someone else gone missing: Marie, the black-and-white cat of her friend, Roz, who ran off the day they arrived from Tacoma. 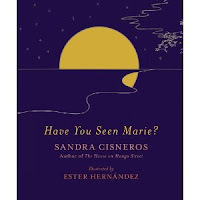 As Sandra and Roz scour the streets of San Antonio, posting flyers and asking everywhere, “Have you seen Marie?” the pursuit of this one small creature takes on unexpected urgency and meaning. With full-color illustrations that bring this transformative quest to vivid life, Have You Seen Marie? showcases a beloved author’s storytelling magic, in a tale that reminds us how love, even when it goes astray, does not stay lost forever. Sandra Cisneros is the author of two highly celebrated novels, The House on Mango Street and Caramelo. Her awards include National Endowment for the Arts Fellowships, the Lannan Literary Award, the American Book Award, and a MacArthur Fellowship. Other books include the story collection Woman Hollering Creek; two books of poetry; and two books of children's literature. 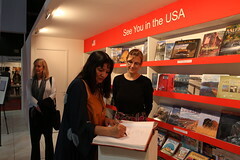 Her work has been translated into more than twenty languages. Cisneros is the founder of the Alfredo Cisneros Del Moral and Macondo Foundations, which serve creative writers. Ester Hernández is an internationally acclaimed visual artist whose work is in the permanent collections of the Smithsonian American Art Museum, the Library of Congress, the San Francisco Museum of Modern Art, and the Museo Casa Estudio Diego Rivera y Frida Kahlo in Mexico City. She lives in San Francisco.